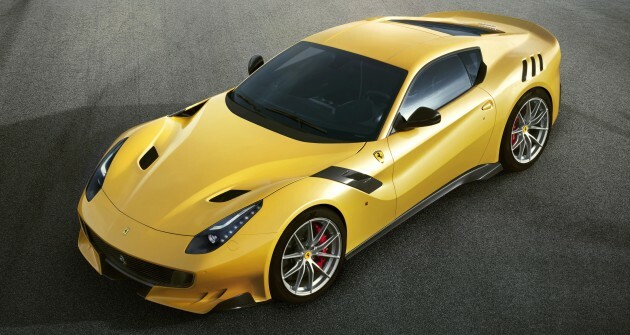 The latest creation to charge out of Maranello is the Ferrari F12tdf, a more extreme version of the F12berlinetta. It packs significant performance upgrades that includes additional power and improved vehicle handling dynamics. With 770 hp and 705 Nm of torque provided from the 6.3 litre naturally-aspirated V12 lurking beneath the bonnet, keeping the supercar under control is certainly no mean feat. Which is why Ferrari has made revisions to the F12tdf to ensure it does not become too unwieldy for its customers or “gentleman racer” clientele. This includes increasing the front tyre width from 255 mm to 275 mm, while also bumping up the front channel size from 241 mm to 254 mm. Ferrari say this results in the front axle being capable of generating higher lateral acceleration of 1.43 g, compared to 1.25 g of the standard F12berlinetta. However, this introduces a drawback when the car is pushed to its limits – oversteer. To overcome this challenge, Ferrari developed the Virtual Short Wheelbase system. This sees an active rear axle being fitted to the F12tdf, allowing the rear wheels to pivot around a vertical axis and thus, counteracting the vehicle’s oversteer. In this demonstration video, we see the system (aka Passo Corto Virtuale if you speak Italian) in effect, ensuring that the car maintains the most efficient line while tackling a corner, significantly decreasing the oversteer effect. A “ghost” car without the system is also featured in the video for a live comparison to further illustrate the effectiveness of the system. This Ferrari system at least from the video has nothing much to shout about. The Honda Prelude system is actually more high tech. At low speed as in going into a parking bay, the rear wheels steer a few degrees opposite direction of the front wheels. At higher speed, the rear wheels follow the front wheels. That was from a loooong time ago..
i recalled there is a remote control toy car had this ages ago..
Ferrari just knew about it and telling the world that their innovation is so great..
Actually, my Lexus GS450h F-Sport has this and I totally love it !